In today’s article, you will read different method to fix Desktop Slideshow not working issue in Windows 10. In case, you’re facing the same issue; then we recommend you must check this article. The Desktop slideshow is one of the best features of Windows operating system which is also available in the latest Windows OS i.e. 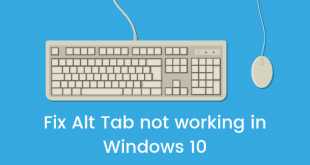 Windows 10. When this feature is enabled, it automatically changes the desktop background or wallpaper at given time interval. Windows 10 users can enable and configure this feature by launching the Settings app -> Personalization -> Background. Under Background title, click on the dropdown and select the Slideshow option to enable the Desktop slideshow feature. Sometimes, the desktop slideshow feature stops working automatically on Windows 10. This means the system stop changing the desktop background or wallpaper at a particular time interval, even when the slideshow feature is enabled. 1. Make a right- click on the blank space of desktop and from the context menu click on the Personalize. Alternatively, you can Press WIN Icon + I keyboard shortcut to launch the Settings app -> Personalization. 2. Under Personalization, select Background tab which is selected by default when you launch the Personalization settings. 3. On the right panel, under Background, make sure Slideshow option is enabled. If not, then click on the drop-down and from the options select Slideshow, and this will fix the issue. In case, Slideshow is already selected and still Desktop slideshow feature is not working, then follow the method described in upcoming lines. By default settings, the Slideshow feature doesn’t work if the laptop is running on battery power. This is to save battery and enhance the battery backup of the laptop. 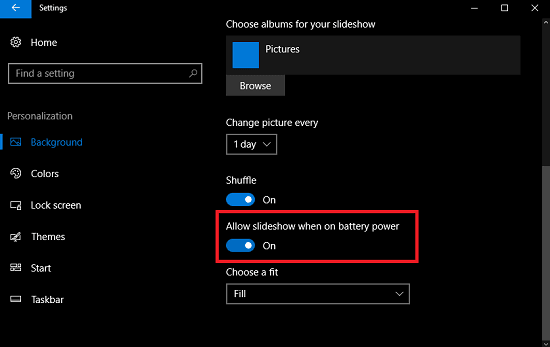 In other words, this means that slideshow feature will not work if it is using laptop battery power. 1. Right click on blank space of desktop, then click on Personalization. 2. Under Personalization, select Background. On the right pane, look for the option labeled as Allow slideshow when on Battery power. Turn on this setting to enjoy the slideshow as desktop background when on battery. 1. Type Edit power plan in Windows 10 Start menu search bar. When you see the same setting in the result, click to launch it. 2. Here in this window, you need to look for “Change advanced power settings” and click on it. 3. 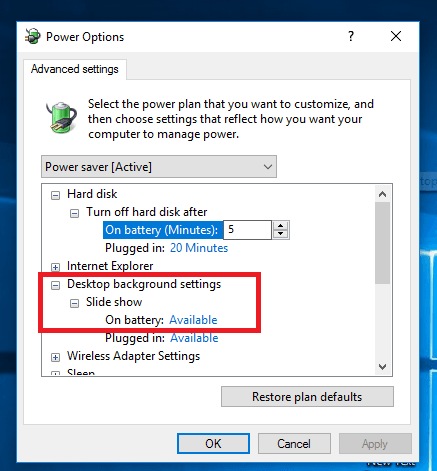 In the Power menu advanced settings window, you need to look for Desktop Advanced Settings and expand it to Slideshow -> On Battery (Available). Here available represent that feature is enabled. If it shows On Battery (Pause), then you need to click on Pause link and from the drop-down select Available. As you may know, that when you enable the slideshow feature, the system asks you to select the folder which has all the photos that you want to use for the desktop slideshow feature. 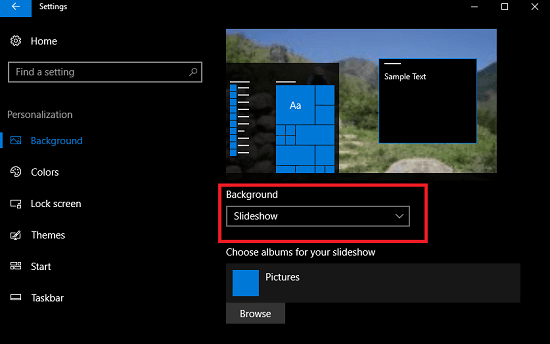 In case, the folder which you have selected for slideshow feature only have one photo, then the slideshow feature will not work because to use this feature the selected folder need to have at least two or more feature. So make sure to add more than 3-5 photos or desktop background in the folder to take advantage of Windows 10 desktop slideshow feature. 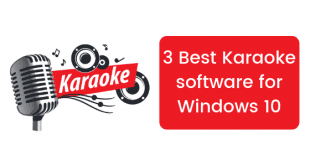 If none of the above-mentioned methods worked for you, then it may be due to the recently installed third-party desktop customization tool. 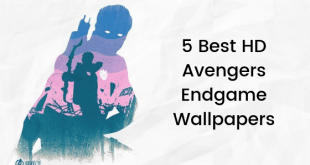 In case, you’ve recently installed any desktop customization tool like Rainmeter or related, then uninstall it from your computer, reboot and then check if Desktop slideshow feature is working or not. In case, the desktop slideshow feature was working flawlessly up till now; then you can fix the issue by restoring the Windows 10 PC to earlier date. All you need to do is to restore your computer to a date when Desktop slideshow feature was working. So these are some of the possible fix and methods which you can use to fix desktop slideshow feature not working issue in Windows 10. Why don’t you give a try to these methods and let us know which one worked best for you?